An Uninhibited Infusion of Hops. We continue our commitment to innovation with our most aggressive offering yet Unearthly is a manifestation of the brewers crafts skillfully balancing art and the forces of nature to produce a divine liquid. Delicately pour a taste into a fluted glass. Smell the enchanting aromas of the hops come forward as your first sip divulges this beer’s fervent soul. To underestimate Unearthly is to trifle with the mysteries of the universe so please consume wisely. Wow, it is hard to believe that this will be my 100th beer review. I didn’t really plan on a special 100th brew but I do have a good one in the beer frig. It was just an impulse by on my Friday stop at State Line Liquors; Southern Tier Un*Earthly. This beer single handedly changed my perceptions on American IPA’s. Well, Imperial/Double IPA’s anyway. This may have been my first American Imperial/Double IPA. 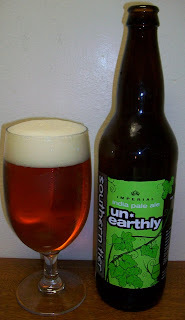 I was extremely intrigued by the intense flavors and hop/malt balance. And it is still one of my favorite Imperial/Double IPA’s. This will be the first time I’ve had this beer since starting my blog. It will be interesting to see how this beer holds up through a full review. I was so excited about my 100th review I over poured this one. The beer pours a clear copper color with amber hues and a very creamy white head. I’m not very good at differentiating hops but I can tell that this nose is filled with cascades. The nose is not limited to hops there are also sweet caramel malt aromas. Now that’s an IPA that I can love. This is nice, really nice. Sweet caramel almost toasted malts up front. A building hop presence makes its self know in mid taste. The back end and finish has the most intense but nicely balanced taste of hop bitterness and caramel malts. The bitter dry finish fades quickly with the tastes of rich malts and alcohol. The final aftertaste is not really bitter at all. It is more malty then anything. The entire sip leaves your senses wondering what hit them. Then just a second or two later you go for another sip to experience this all over again. This is a wonderful beer. The alcohol is definitely there but it is not overwhelming the beer. This beer is however very intense with a high amount of malt, hops and alcohol. It is nicely balanced but still not for the faint of heart. The head on this beer has not quit. There is still a nice protective layer over the top of the beer with a nice ring around the glass and it is leaving some excellent lacing. This beer even gets better as it warms. I have misplaced my thermometer so I can’t give you an accurate temperature reading. I assume this beer is in the low sixties now. This is a beer you have to be ready for. It’s not an easy drinking afternoon ale. It is pretty intense but also very enjoyable under the write circumstances. Like a cold winter night. As this beer warms you can start to pick up more of that 11% ABV. It is still very smooth but that alcohol is reminding you that this is a sipping beer. The final sips where very close to room temperature and still excellent. 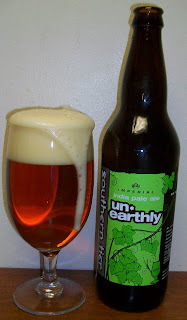 This is a superbly brewed and excellent balanced Imperial/Double IPA. Like I said earlier this hearty style beer is not an easy drinking beer and not for everyone. For a final grade this is an A or maybe an A+ for an Imperial/Double IPA.